We saw how we can connect to database. But how is the database laid to process all user requests? Since it is responsible to store huge amount of data and is capable of handling multiple requests from users simultaneously, it should be arranged properly. One can imagine a database as a brain! How is the structure of brain? Bit sophisticated and each part of the brain is responsible for some specific tasks. Similarly, Database is also designed. At very high level, a database is considered as shown in below diagram. Let us see them in detail below. Applications: - It can be considered as a user friendly web page where the user enters the requests. Here he simply enters the details that he needs and presses buttons to get the data. End User: - They are the real users of the database. They can be developers, designers, administrator or the actual users of the database. 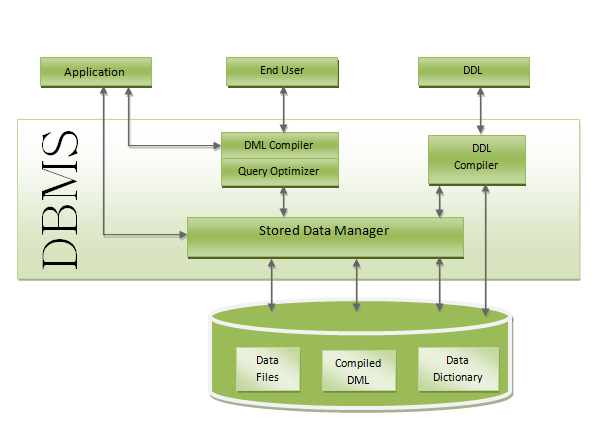 DDL: - Data Definition Language (DDL) is a query fired to create database, schema, tables, mappings etc in the database. These are the commands used to create the objects like tables, indexes in the database for the first time. In other words, they create structure of the database. DDL Compiler: - This part of database is responsible for processing the DDL commands. That means these compiler actually breaks down the command into machine understandable codes. It is also responsible for storing the metadata information like table name, space used by it, number of columns in it, mapping information etc. DML Compiler: - When the user inserts, deletes, updates or retrieves the record from the database, he will be sending request which he understands by pressing some buttons. But for the database to work/understand the request, it should be broken down to object code. This is done by this compiler. One can imagine this as when a person is asked some question, how this is broken down into waves to reach the brain! Query Optimizer: - When user fires some request, he is least bothered how it will be fired on the database. He is not all aware of database or its way of performance. But whatever be the request, it should be efficient enough to fetch, insert, update or delete the data from the database. The query optimizer decides the best way to execute the user request which is received from the DML compiler. It is similar to selecting the best nerve to carry the waves to brain! It converts the requests received from query optimizer to machine understandable form. It makes actual request inside the database. It is like fetching the exact part of the brain to answer. It helps to maintain consistency and integrity by applying the constraints. That means, it does not allow inserting / updating / deleting any data if it has child entry. Similarly it does not allow entering any duplicate value into database tables. It controls concurrent access. If there is multiple users accessing the database at the same time, it makes sure, all of them see correct data. It guarantees that there is no data loss or data mismatch happens between the transactions of multiple users. It helps to backup the database and recover data whenever required. Since it is a huge database and when there is any unexpected exploit of transaction, and reverting the changes are not easy. It maintains the backup of all data, so that it can be recovered. Data Files: - It has the real data stored in it. It can be stored as magnetic tapes, magnetic disks or optical disks. Compiled DML: - Some of the processed DML statements (insert, update, delete) are stored in it so that if there is similar requests, it will be re-used. Data Dictionary: - It contains all the information about the database. As the name suggests, it is the dictionary of all the data items. It contains description of all the tables, view, materialized views, constraints, indexes, triggers etc.